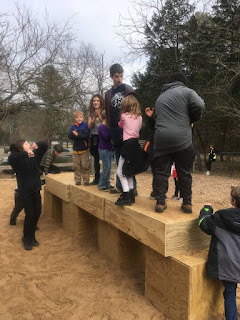 The addition of 4 more supersized Froebel blocks to the CSS playground has been a hit with the kids and teachers alike. As with the simple cubes, the flat tiles are continuously re-arranged into new configurations. Now having twice as many blocks, they have become a gathering spot for performance art. The students have become watchful for fingers and toes as the blocks are moved from one place to another. Yesterday I met by phone with members of the Arkansas Arts Council and a small panel of artists to select the Arkansas Living Treasure for 2019. That craft artist will be announced later in the year. In the CSS wood shop my kindergarten students made toy cars that they then turned into airplanes and wheeled sculptural objects. I'll post photos on my instagram account. Make, fix and create... Enable others to learn likewise. Building a Legacy in the Arts. as easy as one, two, three? measuring, marking and drawing straight lines. "Do you have a screw gun?"